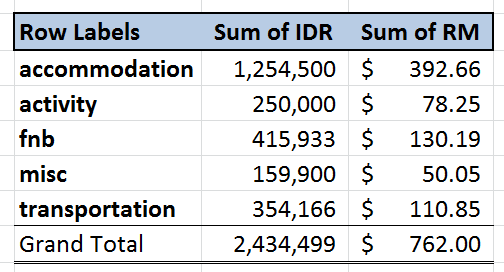 so basically, below are our final expenditures. the budget above doesnt include our air tickets. activities were island hopping & snorkeling, & balinese massage. we got return flight ticket from airasia at a price of rm227.08 lastyear during promo. day1: lombok international airport to mataram, stay in mataram. -public bus from airport to mataram: 25,000 perperson. -taxi from mataram bus station to hotel: 25,000/3 = 8,333 perperson. 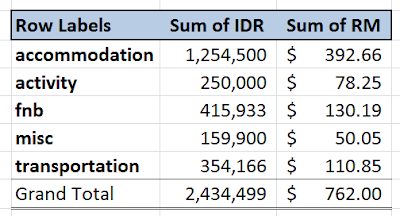 -public boat from bangsal jetty to giliTrawangan = 15,000 + (7500entry to giliT) = 22,500 perperson. We opted public boat instead of speedboat because we were poor liddat😂😂😂.. We rather spend the money on food and luxury room. Speedboat are around 300-400,000idr perboat (around100-120,000perperson), took 15-30mins from bangsal jetty to gili trawangan, while publicboat cost us only 15,000idr (around rm5) perperson and took around 40-50mins time. Ok ajew. Takde benda nak dikejar and the vacation mmg santai2 aja tidak pon merencana nak melawat sini sana sgt. -island hopping package (boat, life jacket, snorkel, mask, guide) 100,000 perperson. *ralat: taxi ni 320,000 je, tp, imah sedekah another 80,000 so jadi 400,000. = 154,500 perperson for 1night. (we had to take 2 rooms(for 4pax) because there were no triple room). but it is cheap nevertheless. We (4pax) actually prebooked ananda private pool villa (a 2bedroom villa with private pool) at first, but someone decided to burndown her lombok tix for another event, cis!!! So we had to find another accommodation. -private beach (at sunset beach, it is quieter this side as compared to the other side because that side lines up the night market and all the happening bars). -we can always rent the bike for 50,000idr perday if we wanted to go to the happening side. It is only around 10mins by bike..
-all the staff were really friendly and helpful! Love them! -food at their cafe were also delicious. Kalo malas pergi cari food, u can always dine here sahaja. -the sky roof shower! Takot but love. -it is located near ombak sunset resort (whr all the "must-take-photo-here" swings are). Boleh jln kaki je gi situ utk amek gamba. -the price is quite cheap for a luxury resort like this, it got 8.++rating in booking.com with good reviews.We got 3.2juta rupiah (rm1100) for 2rooms for 2nites (actually for 4pax but thr were only 3of us, so tepaksa bahagi 3 lah). Still ok la. = 1,100,000 perperson for 2 nights. fnb : it was already 9pm, most shops & mataram mall (walking distance from hotel) were already closed by the time, so, x dpt nk makan luar, luckily we did brought wendy burgers from klia2, so we only ate the burgers. and then we bought drinks & toiletteries at a mart nearby. breakfast included at the hotel. lunch at WR ibu Dewi (sedap giler) 25,000 perperson. dinner at the night market (seafood) around 155,000 perperson.